February 13, 2013 - We made exactly zero stops at fast food in January, but we did do a bit of cleaning in the kitchen, and found this gem stashed in one of the drawers. 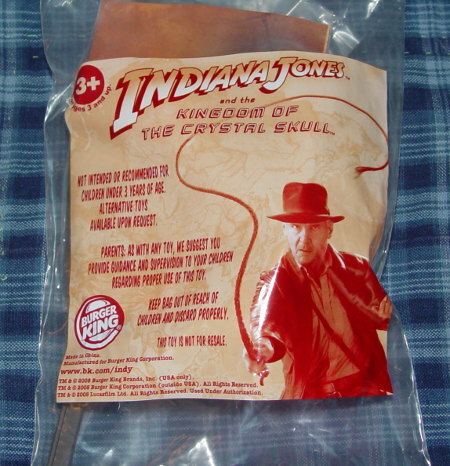 From 2008, it is a Burger King toy from Indiana Jones and the Kingdom of the Crystal Skull. I was momentarily excited until I turned it over and saw that it was Mutt Williams. The boy didn't care either, so we'll leave it in the drawer until nicer weather arrives and we can play with outside on the sidewalk. Let's see what's out there in restaurants this month! 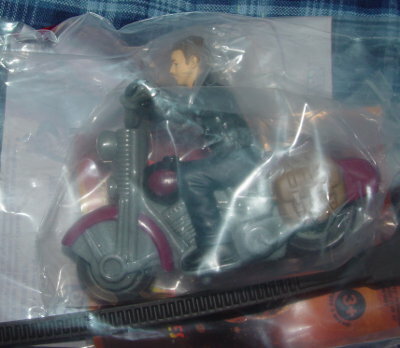 It looks like we'll be getting several of these toys. - McDonald's has Transformers Prime and Hello Kitty toys in their Happy Meals, with Hexbug and Barbie shown as the next promotions. - Taco Bell lists "Paper Pirates" as their current toy, with a Dive Olly Dive book for the kids under 3. - The Chick-fil-A site lists five different Blue Orange games as the goodie in their Kid's Meals. The "kids under 3" item appears to be a board book. - Sonic has four different Emoti-Tots figures in their Wacky Pack meals. - Burger King has Discovery Kids Space toys in their Kids Meals, with Cut the Rope: Time travel toys coming soon. - Carl's Jr. and Hardee's have Hotel Transylvania toys, with Rise of the Guardians toys coming in late February.